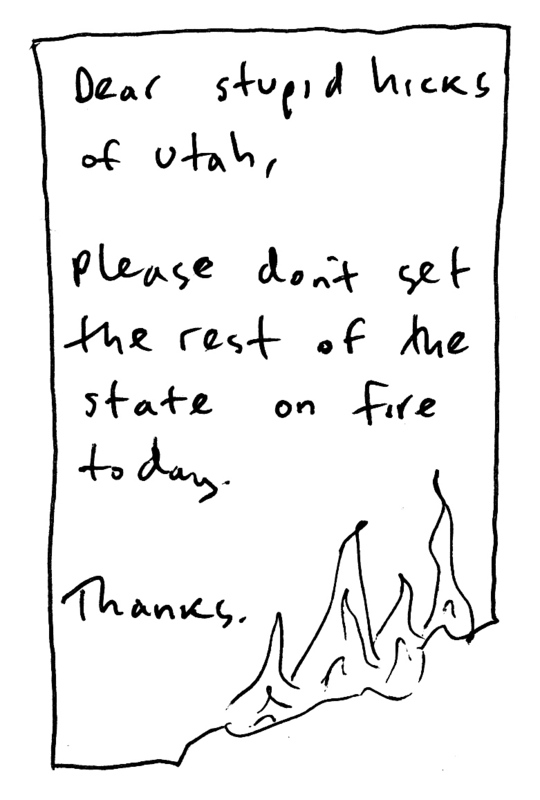 The funny (maybe not ha-ha funny) thing is, I drew this on the 2nd and was going to post it yesterday, but was beaten to the punch when they got a fire going near my parents' house in Alpine. I post it now, because I bet the stupid hicks in question have some fireworks left over from yesterday, and even though none of them probably read this. And do please note that it is only addressed to the stupid hicks; I'm not really worried about the regular hicks. I shrugged and laughed. "No need to get all flustered and embarrassed," I said. "Everybody does it." "No," the judge replied sternly. "Almost no one even thinks of doing what you've done. You are a remarkably awful person." I especially loved everything about this one.